Corporations may need to make general announcements to everyone or publish news to several groups of agents or individuals. Also, OTRS administrator may need to contact with specific agents regarding an event. OTRS gives the administration the tool Admin Notification making sending announcements and news to the masses of users accurate and timely, to target group of people, simple. Administrators can send notifications based on a specific list of recipients, or a group of users inside OTRS, with powerful text editor enhanced content. Use this screen to send administrative messages to specific agents, group or role members. 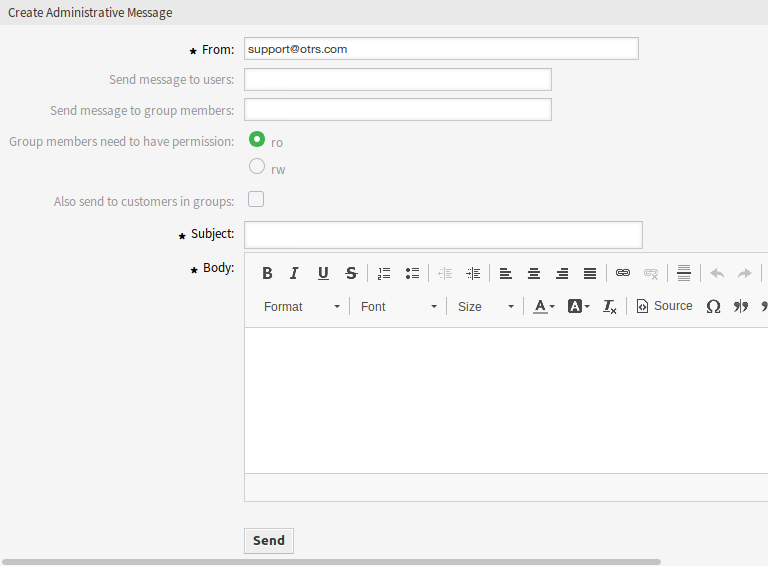 The message compose screen is available in the Admin Notification module of the Communication & Notifications group. The following settings are available when composing an administrative message. The fields marked with an asterisk are mandatory. This email address will be added into the From field of the message. One or more Agents can be selected in this field, to whom the message will be sent. One or more Groups can be selected in this field, to whose members the message will be sent. With these radio buttons can be selected, if a group member need read-only or read-write permissions to receive the message. The subject of the messages. The body text of the message.